← Fastest EcoBoost Mustang or Ford? Breaking Bad – Watson Racing shatters the S550 e.t. record with a low-9-second run. Until recently all had been quiet in the world of 2015 Mustang GT e.t. records. Terry “Beefcake” Reeves took the record away from the AmericanMuscle.com crew and it stood for quite a while. Until recently all had been quiet in the world of 2015+ Mustang e.t. records. Terry “Beefcake” Reeves took the record away from the AmericanMuscle.com crew and it stood for quite a while. 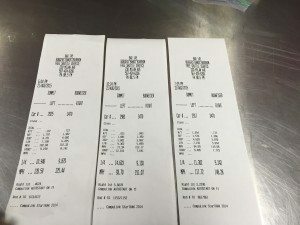 Recently, as reported last week, the AM bunch snatched the record back with a 9.49 pass. Now a new player has awakened and not only claimed the record, but shattered it. Over the weekend, Watson Racing ripped off a 9.13 at 151 mph at Summit Motorsports Park to etch its 2015 Mustang SEMA project into the history books. Hopefully you’ve been following the saga of Watson Racing’s 2015 Mustang, which was constructed for last year’s SEMA show. We have closely covered the car’s ongoing transformation here at SVTP, and this car is definitely not a show-only machine. Over the weekend, the Watson team took this car to Summit Motorsports Park and reset the 2015 Mustang GT e.t. record. Not to bad for a street car with a valid tag and a 100-mile fuel-tank capacity. Regular readers of the SVTP Front Page are all too familiar with the saga of Watson Racing’s street/strip S550. Originally constructed for the 2014 SEMA Show, this continued its mission of streetable quarter-mile prowess with a series of upgrades, including a Whipple supercharger, FAST EFI, lightweight windows, a bolt-in 9-inch IRS, and a10-rib blower drive. Since we last checked in on the car, the Watson team finally removed the car’s manual transmission in favor of a more consistent Turbo 400 automatic. Driven by a 10-rib belt, the Whipple 2.9-liter supercharger boosts the new-school Coyote with about 18 pounds of boost, which creates well over 928 horsepower at the rear wheels. 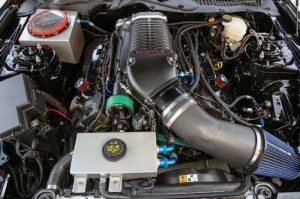 This 5.0-liter also wears Ford Performance Racing Parts camshafts and a full exhaust made up of American Racing Headers long-tube headers, an American Racing Headers X-pipe, Pypes electronic exhaust cut-outs, and Magnaflow mufflers. The combo is backed by a Turbo 400 automatic trans and Watson Racing’s bolt-in 9-inch IRS. The reason we haven’t heard much about the car is that Watson has been busy working on projects for customers. Those customers include Ford, Miller Motorsports Park, and plenty of individual racers. They recently took a break from those tasks to have some fun with their own rides at Summit Motorsports Park in Norwalk, Ohio. Last Friday night the Watson team only had time to pull off three hits at the track. The first run produced a slipping and sliding 9.87 at 125.44. After adjusting the car’s tire pressure, it responded by breaking the existing e.t. record with a 9.24 at 148.28. However, the Watson team was not content with that. 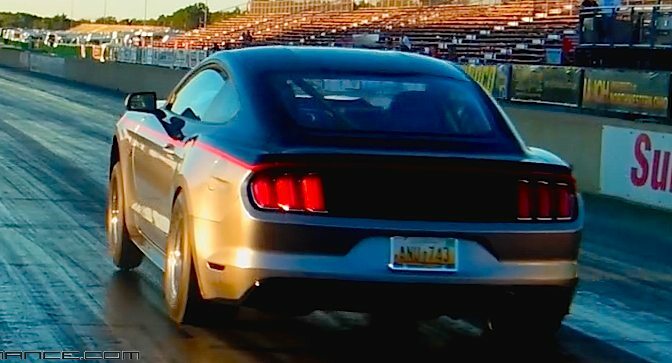 On the last hit of the night, the car did more than back that run up, it clicked off an astounding 9.13 at 151.07 to solidify its place as the quickest 2015 Mustang GT on the planet. 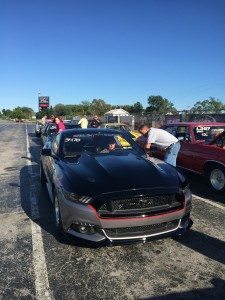 Of course, it wasn’t just for fun, as they were prepping both this 2015 Mustang and the company’s Cobra Jet for the NMCA World Street Finals in Norwalk, Ohio, this weekend. With Chuck Watson Sr. behind the wheel, the Watson Racing S550 blasted off a series of increasingly quicker 9-second runs. Out of the gate it ran a 9.78, but traction was obviously an issue. After the team adjusted the tire pressure, the Watson S550 broke the 2015 Mustang GT e.t. record with a 9.24-second pass. Feeling there was more in the car, they lined up again for one last pass. Not only did they back up the record, but ran an even quicker 9.13 at 151 to leave no question that this is the quickest 2015 around. 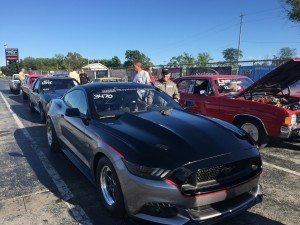 The Watson team was also testing its Cobra Jet Mustang at Milan in preparation for the coming weekend’s NMCA World Street Finals in Norwalk, Ohio. The 2015 Mustang will run in the True Street class and they are hoping it runs even quicker on the big stage. Yes, you heard the man, there is still more in this combination with further tuning, ice in the intercooler and an open exhaust. With Internet e.t. records being as ephemeral as pop-music stardom, the Watson Racing team is looking to make another mark at this weekend’s NMCA race.